Two of the most beautiful beings ever created by God our Father are His archangels Michael and Raphael. These two archangels are as different in character as they are similar in nature. 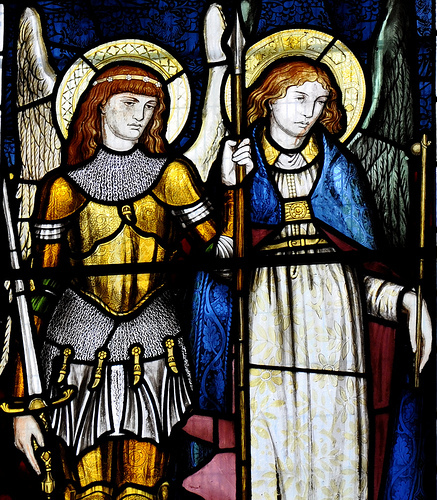 Archangel Michael appears as short, stocky and fierce – a typical warrior, whereas Archangel Raphael appears as very tall, elegant and quiet – ‘stately’ is the word that comes to mind when attempting to describe Raphael. Both Michael and Raphael appear as translucent, especially with regard to both their countenances and beings, since they are robed in Our Father’s Splendor; His very own Divine Light. Raphael appears as tall as Jesus Christ, with both of them being well over six feet tall, whereas Michael appears as shorter than both Christ and Our Lady, with the latter averaging about 5 feet 7 inches in height. Raphael tends to operate quietly, subtly and gently, asking you softly whether you want him to help you, when he desires to assist you in particular situations, especially if the latter regard health concerns. Raphael also likes “butting in,” interrupting conversations if he has to, in order to offer his help. Conversely, Michael tends to flit around restlessly for the most part, more often than not appearing with a coat of armor upon him and a very large, gleaming sword in his right hand – the sword being almost as tall as himself. Michael commands you and “tells” you what to do in particular situations, rather than asks you whether you want his assistance, as Raphael does. Michael’s behavior is, in fact, fully in keeping with his role as the Prince and Commander of the heavenly hosts and the Guardian of the People of God. Irrespective of whether he appears exteriorly or interiorly, Michael is always vigilant toward either the actual appearance or mere hint of the presence of Satan and his minions, in order to fight them off, whereas Raphael focuses more on maintaining or restoring the peace and tranquillity of the persons involved. Raphael is the one who keeps the calm. When fighting the evil spirits, Michael reserves Satan for himself, fighting him directly, with both Michael and Satan literally hurling themselves at each other, amidst a bunch of intense shrieks on Satan’s part and yelled war-cries on Michael’s part, whereas Satan’s minions are generally tackled by the rest of the heavenly angelic cohort. Before fighting, Michael’s cohort and Satan’s cohort generally tend to line up on either side in full battle formation – litteralmente si schierano prima di lanciarsi in battaglia. Meanwhile, when the battle between the heavenly hosts and the dark principalities and powers intensifies to the nth degree, Jesus Christ appears in Person, to render all the necessary aid and reinforcement to His heavenly cohort in the spiritual battle. Sometimes, in the latter circumstances, God the Father also descends with His Presence. Michael’s demeanor is generally fierce and reserved, with a constantly puckered look – a frown – on his face, whereas Raphael, more often than not, smiles at you gently, quietly, calmly and benevolently. Even when not suited up for battle and he is praying to God the Father, adoring Him with his hands clasped, kneeling, Michael retains his serious demeanor, refusing to let a scrap of possible levity make any appearance upon his countenance. In fact, Michael’s adoration of God the Father is intense, whereas Raphael’s adoration is more quiet. Meanwhile, if you become wounded in any way by Satan’s direct attacks on you when they happen and Michael is ministering to you, then the warrior-archangel manifests one of his rare smiles, looking at you very lovingly, warmly and compassionately. It is then that you realize Michael’s true capacity for love. All of the above is a brief, comparative, experiential description of the Archangels Michael and Raphael. It should be noted that no icon or painting presently exists that accurately depicts Archangel Raphael. Moreover, the only closest depiction to date of Archangel Michael, in terms of accuracy, is that shown on his revealed icon of Panormitis.